Despite the popular notion today, fiberglass and plastic resins were not "new" technology in the mid-1950s, nor was Clinton Pearson the first person to use them to build sailboats. This begs the question: who did build the first fiberglass sailboat? 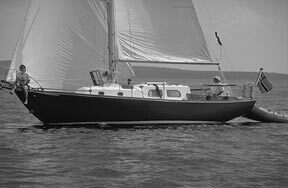 Jeff and Nancy Larson enjoy their 1965 Pearson Vanguard, Nordhavn, the 32-foot big sister of the Triton. The Vanguard was introduced in 1962. According to Dan Spurr, editor of Practical Sailor, and the author of a forthcoming book on the history of fiberglass sailboats, Heart of Glass, "It probably was a fellow named Ray Greene in Toledo, Ohio. He built a fiberglass and polyester sailboat in 1942, probably a Snipe. So a sailing dinghy was the first fiberglass sailboat." After a pause he adds, "But you have to watch your terms." It turns out there were several earlier boats made of fiberglass and various plastic resins, but most of them were too brittle for practical use. Dan says it was the development of polyester resin that started the fiberglass boat revolution. In part, this problem of terms revolves around the separate, but parallel, developments of fiberglass and plastic resins. The ancient Phoenicians and Egyptians made glass, and are said to have used glass fibers as decorations and to reinforce pottery. (To add to the many coincidences of the history of fiberglass boats, the Phoenicians were the master shipbuilders of their day. One can only imagine what they could have done with fiberglass construction.) Through time, many other civilizations made glass strands, primarily for decoration. In 1870, John Player developed a process of mass-producing glass strands with a steam-jet process to make what was called mineral wool for insulation. A patent was awarded to an American named Herman Hammesfahr in 1880 for a type of fiberglass cloth also woven with silk. Fiberglass experimentation continued into the 1920s, with the first actual fiberglass fibers we know today being made in 1932 - by accident. A young researcher for Corning Glass named Dale Kleist was trying to weld together two glass blocks to make a vacuum-tight seal when a jet of compressed air inadvertently hit a stream of molten glass. The resulting spray of fine glass fibers turned out to be what researchers had been trying to make for years. In 1935, Corning Glass joined forces with Owens-Illinois, which also had been experimenting with fiberglass, to develop the product further. The word "Fiberglas" (note only one "s") was patented in January 1936, and the two companies merged to become Owens-Corning in 1938. Research showed the glass fibers to be light, yet very strong. On an equal weight basis, a strand of fiberglass is actually stronger than a strand of steel. Development of plastics began in the mid-1800s, in part due to a challenge from a billiard ball company to find a new material to replace ivory for its chief product. Patents were awarded for a variety of plastics by the late 1800s. Research speeded up in the 1920s, and again with the approach of World War II, due to the shortage of many natural products. Carlton Ellis of DuPont was awarded a patent for polyester resin in 1936. The Germans furthered the manufacturing process of this early polyester by refining its curing process. Early in World War II, British Intelligence stole these secrets and turned them over to American firms. American Cyanamid produced the direct forerunner of today's polyester resin in 1942. This early polyester resin quickly ended up in a number of manufacturing hands. Owens-Corning had been experimenting with fiberglass cloth and resin combinations to create structural elements for airplanes. By 1942, the company was turning out fiberglass and polyester airplane parts for the war effort. Back in Toledo, Ray Greene, who had studied plastics while a student at Ohio State, had been working with Owens-Corning on fiberglass composites. He had made composite boats as early as 1937, but was searching for just the right plastic to use for boats. He received a shipment of the polyester resin in 1942 and produced a daysailer. Others followed suit. Dan says, "B.B. Swan made a small fiberglass catboat in1947. Carl Beetle built fiberglass boats at a GE plant in Pittsfield, Mass. He exhibited his fiberglass boat at a show in January 1947." The first sailing auxiliary made from fiberglass appeared in 1951. "It was called the Arion, a 42-foot ketch." states Spurr. "It was a one-off design by Sidney Herreshoff. Then Fred Coleman's Bounty II came out in 1956." Dan goes on to explain that Ray Greene was not finished either. "He formed his own boatbuilding company and produced a 25-foot Sparkman & Stephens design in 1957 called the New Horizon," says Spurr. "He built 175 of them. That was a pretty good number of boats, and right before the Triton, too." Tom Potter, the driving force behind the Triton, agrees. "Ray Greene did bring out a fiberglass boat before we did, at least what you would call the first sailing yacht," he says. "It was kind of an odd looking boat, though. The Triton certainly was the first mass produced boat that sold well." Bill Shaw also acknowledges Ray Greene as the first to build a fiberglass boat. "And I worked at Sparkman & Stephens when we designed the New Horizon," he says. "I remember Ray Greene very well." How the Pearson cousins came to be viewed as the fathers of the modern fiberglass industry is not clear, given the many boats that preceded the Triton. Nevertheless, it was the Triton that captured the buyer's heart - and pocketbook - in 1959. In the end, that's all that matters.